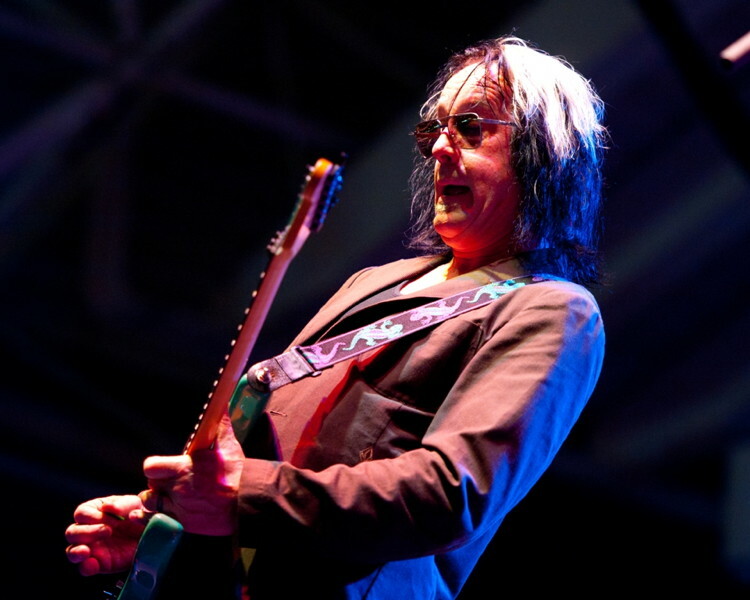 A friend writes: Was Rundgren good? Hadn’t seen him since college, long, long ago…. TR: I didn’t realize until I got down there that it was a total UTOPIA gig (tour details, reviews here). Great show if you love prog-rock. Todd dressed in HOWLINGLY GARISH PSYCHEDELIC LEATHER COWBOY CHAPS beneath UNIRONIC NIXONIAN JOWLS. I’ve never been fond of this “take me seriously” sideshow, the overly mannered, elaborate, complicated and garrulous third of his career. But not many in the audience seemed concerned they weren’t getting “Cliche” or “Meaning of the Verb to Love” or “Hello, It’s Me.” Strictly the white man proving himself unworthy of George Clinton. All of which struck me as extra-unnecessarily weird since Todd had just put out a rather steam-powered assault on Robert Johnson songs, which goes unmentioned on his site, and which at least boasts great material. But I’ll admit he played wondrous guitar and sang beautifully. Crowd ate it up. Finale was “Just One Victory,” one of his almost-anthems. He thanked all the Berklee students, and told them their assignment was to transcribe everything they just heard. Half of them had already finished.